Yesterday’s post about California Rolls and my trip to Nobu Tokyo got me interested in the history of the California Roll and made me reflect on my most recent sushi experience this past weekend. Like the “Chinese” fortune cookie, the California Roll was actually invented in America. According to several Internet sources, it was created in the 1960s/early 1970s by a chef named Ichiro Mashita who worked at a Japanese restaurant in Los Angeles named Tokyo Kaikan, which had one of the first sushi bars in the city. Mashita decided to substitute avocado for fatty tuna (toro) due to the avocado’s oily texture. In addition, he began to make the roll inside-out, with the seaweed (nori) on the inside and the rice on the outside, since Americans did not like eating nori on the outside. Add cucumber and (imitation) crab meat, and the California Roll was born. The rolls helped to introduce sushi to Americans unaccustomed to eating raw fish and helped launch sushi’s popularity in the United States. Over the next several decades, chefs across America experimented with creating different kinds of rolls with all sorts of traditional and non-traditional ingredients. This creativity would also influence the making of sushi rolls back in Japan. This brings me to my most recent trip to my favorite neighborhood sushi restaurant in Tokyo, Midori Sushi, where my wife tried their special tuna roll. 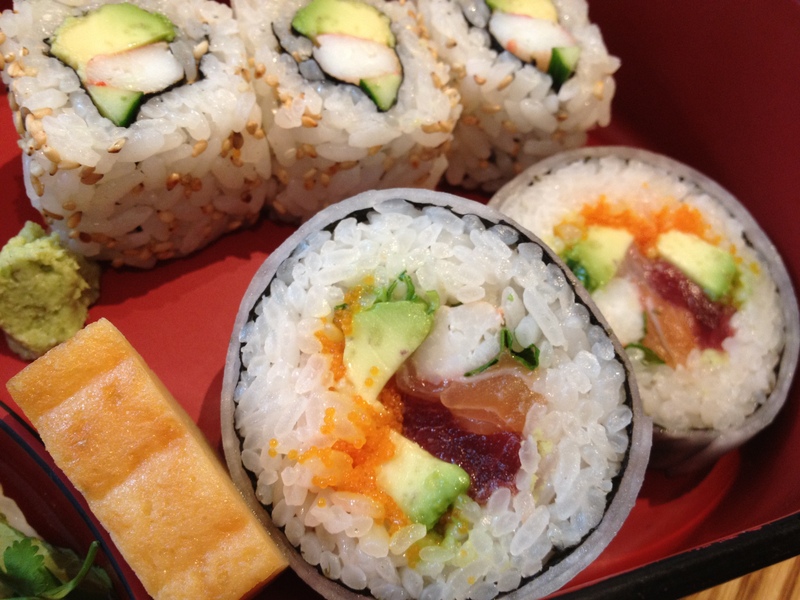 Just like Mashita’s invention, the roll is made with rice on the outside. Substituting in reverse, Midori used at least two different cuts of tuna in place of the avocado and crab meat. Furthermore, they put a large dollop of ground fatty tuna with green onions (negitoro) on top. The result: pure deliciousness. It’s at a whole level above the California Roll. We also ordered an eel roll, which is made of egg omelet, cucumber, and pickled gourd on the inside which is overlaid with fresh water eel, topped with sweet sauce. Also very good. But as tasty as the rolls are, I still prefer nigiri sushi. For me, it’s difficult to go back to the California Roll after having great sushi like this. It has changed how I think about sushi, what I look for, and what I expect out of it. There’s nothing wrong with California Rolls. But in the same way that we like certain foods as children but not as adults, I think one’s tastes evolve as they explore and experience more of what the world has to offer. The California Roll may be the gateway into sushi for many people, but I hope they don’t stop there, that they keep venturing forward and try new things on the menu. There’s a big, tasty, and amazing world of sushi out there that just waiting to be discovered. This entry was posted in Food, Sushi and tagged Asia, California Roll, Japan, Japanese cuisine, Sushi, Tokyo, tuna. Bookmark the permalink.